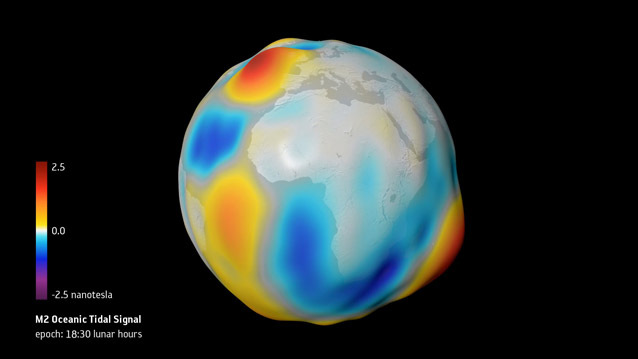 In our latest animations for the European Space Agency, presented at the 2018 General Assembly of the European Geosciences Union in Vienna, we visualise data from the Swarm satellite constellation, revealing new science results concerning the Earth's magnetic field. 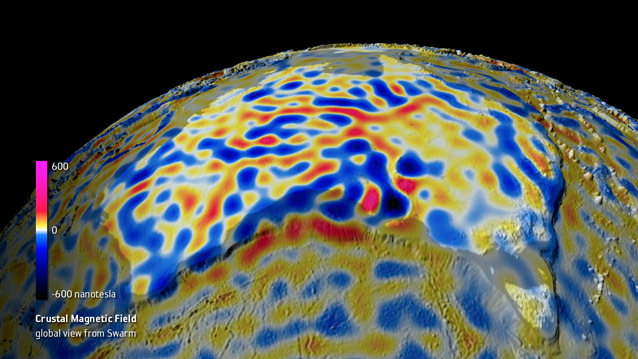 From an orbital height of 530-460 km the Swarm satellites are able to measure variations in the magnetic field due to the magnetisation of rocks in the Earth's crust, resulting in the most detailed global maps to date of the lithospheric magnetic field. The Swarm constellation is sensitive enough to measure tiny disturbances of the magnetic field caused by the tidal motion of water in the oceans. The animation shows the tidal signal over the course of a lunar day. These animations, produced for the EGU2018 conference in Vienna, are the first in a series being produced by Planetary Visions for ESA's Swarm mission.